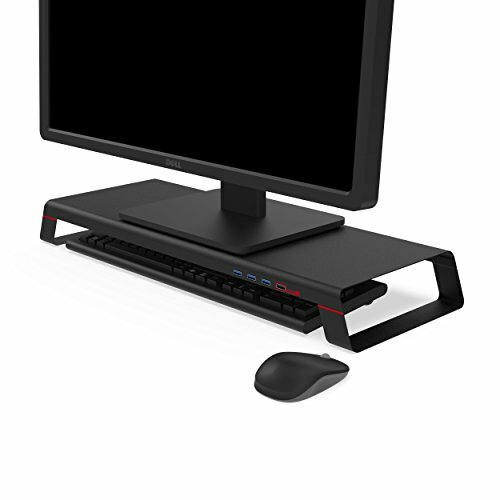 The MONITORMATE miniS is a monitor stand with a USB hub, creating a multifunctional expansion platform, and the perfect partner for your always crowded desktop. The monitor goes on top the platform, while the extra space underneath is perfect for putting away the keyboard and mouse. Whether at the office or in the home, this platform can help you to have your clean desktop back, and get all the convenient functions at the same time. You can use miniS for USB charging only and no need to connect to the computer or laptop. All 4 ports support USB charging when a computer is not turned on. Space underneath is perfect for putting away keyboard and mouse and get all convenient functions at the same time. Strong Structure Design - Sturdy build designed for high weight capacity, no worries about bending anymore. If you have any questions about this product by Monitormate, contact us by completing and submitting the form below. If you are looking for a specif part number, please include it with your message.